When I became interested in bag making, which I must admit was not so long ago, I was surprised that there are so many patterns online, yet there is little information about how to make a pattern by yourself. Why do I think it’s better to make a pattern than to download it? The answer is simple: rarely will the bag pattern meet all your requirements. You may want to change the size, change the details, change proportions and etc. Why make a bag, if it’s not your dream bag? The solution is simple – make a pattern. When you have a simple understanding of how the bags are constructed, you can easily draw a pattern for a handbag you have in mind. My idea is that you can easily make a pattern even if you’re not a professional and you have never made it before. When I wanted to learn how to make a handbag, I took a bag (any bag – design doesn’t matter here) and looked closely at it, analyzing what details does it have. After this, I draw a bag I want to make and then draw details that I need. I would then draw the details in its original size and voilà – the pattern is ready. 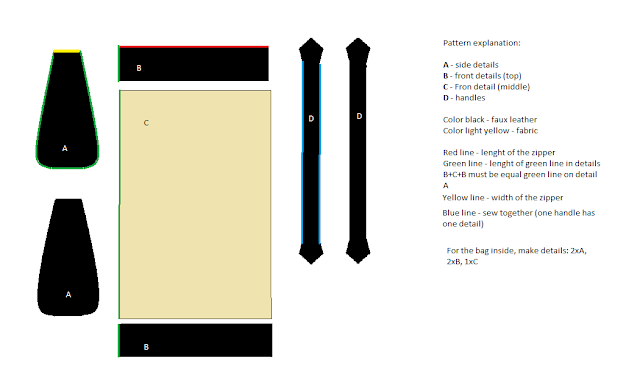 The basic pattern of a bag. I didn't write measurements: you can make it in any size you want. You can add any detail you want. Feel free to be creative! If you make a sketch like that, all you have to do is to think of a hardware you want to use and how to connect pieces together (and what seams to use: visible, invisible or decorative ones). And that's it! P.S. when you make a pattern, don't forget to leave fabric for seams! P.P.S. I will show more examples in the future!